I can’t help myself—I’m like a personalized TV/movie/books recommendation service sometimes. Not because I know so much (what I wouldn’t give to be The Oracle! ), but simply because I have an excellent memory and widely ranging preferences. And let’s be honest, who couldn’t use a little help when it comes to digging through Netflix to find the true gems? Do allow me to lend a hand . . .
I’ve taken my top recommendations, all currently available on Netflix, and sorted them by the tone of the show (quirky, heartwarming, or suspenseful) and then narrowed them by time period or genre. Quirky and . . . Although the title makes it sound dark, it’s actually quite a light, even humorous, mystery show. Set in the Caribbean, it follows a British detective and his team as they solve murders. But instead of going all dark and creepy, it’s got a light style in a classic who-dun-it type of way. And as a bonus, the murders are never straight-forward, so the plots are actually intriguing as well. Oh the South, a region entirely misunderstood by those outside it and lovingly tolerated or embraced by those who know it well. Set in small town Alabama, this show follows the missteps of a well-intentioned New York City doctor. With a quirky sense of humor and a full-on portrayal of Southern culture, it’s charming and occasionally absurd, but in the sweetest way possible, bless its heart. This show centers on a sheriff in a town full of geniuses whose inventions often go awry. I have to admit—I’m not an avid SciFi watcher, but the SciFi elements are secondary to the interesting characters, which this show has in spades. Add a quirky, witty sense of humor and it’s just refreshing when you want something light. Heartwarming and . . .
As you can probably discern from the title, this show follows a team of midwives/nurses/nuns as they provide healthcare to the South End of London in the 1950s. One warning: it can occasionally be a bit graphic. You know, childbirth and all that. But it’s a sweet, emotional show. If you emotionally connect to shows, you will probably cry at some point. Consider yourself warned. If you have any kind of social media account, you’ve probably heard about this show. Produced by Netflix, it begins with the early days of Elizabeth II’s reign. I’ll admit, I had low expectations, but I was impressed. Instead of wandering into the all-too-common caricature land, where most based-on-a-true-story shows end up, these actors manage to portray their subjects in complex, and seemingly authentic, ways. (Major shoutout to John Lithgow for his nuanced portrayal of Churchill.) One season in and I’m already hooked. Let’s be honest, while the premise is interesting, I kind of assumed the show would lose steam after a season (how long can you expect the premise to carry it?). But it managed to dig deeper than the switch to the complexities of transitioning into adulthood while balancing two families. Add to that the fact that one of the girls switched at birth is hearing impaired and it’s one of the most respectful representations of hearing impairment and the Deaf community that I’ve ever seen. It’s not exactly award-winning quality, but this charming Hallmark show offers beautiful scenery as it follows a judge in a small coastal town in Washington. It is the definition of a heartwarming family drama, complete with relationship and work problems. It’s never scary or creepy. It’s like a marshmallow–sweet, airy, pretty. Suspenseful and . . . I cannot say enough good things about this show. Somehow I missed it until last summer, and I cannot imagine how. 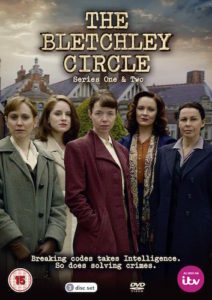 It follows a group of wonderfully intelligent British women who worked as codebreakers during WWII. In spite of their attempts to settle into simple, boring lives after the war, their abilities end up pulling them into investigations of complex crimes. Who cares about murders during a war? DCS Foyle, that’s who, although he often acknowledges the irony of investigating single deaths while Great Britain is engaged in bloody WWII. Cerebral, subtle, and witty, this show will force you o pay attention in the best kind of way as Foyle uncovers complex motives with the help of his delightfully quirky driver/assistant, Samantha Stewart. I’ll be honest—I’m not generally a fan of retellings or continuations of classic stories. But in this case, I made an exception. Because, murder. We meet Elizabeth and Darcy years after their wedding when someone is killed in that gorgeous estate called Pemberley. With masterful performances, this mini-series is well worth the time. Based on the description on Netflix, I assumed this would be kind of weird and juvenile, but I decided to risk it. I’m glad I did. While it does certainly have a seasoning of teen angst, this show, based on a series of books, follows an Elvin princess who finds herself responsible for basically saving the world. And it’s set in the future rather than an alternate world, which is refreshing departure from the standard urban dystopian future. The plot is complex, the characters authentic (the main character Amberle was a particular favorite of mine). If you like fantasy, this one’s worth a shot. Waking up with no memory of your past is a bit of an overdone premise, but set it in space and it becomes much more compelling. This show explores the secrets and histories of six individuals aboard a starship. They have to deal with current problems while attempting to figure out who they were in the past, although they may not like what they discover. I found each character to be unique and, in some way, relatable, which sucked me in and kept me watching. And there you have it, folks: my top recommendations for Netflix. Maybe you will find a new favorite among them. Any shows you think I should add? I’ll be honest: I’m one of those writers who usually has about a dozen tabs open while I’m writing. Not because I’m checking Facebook, but because I’m confirming details. Oh the details! I love them. I won’t even pretend I don’t. And over the years, I’ve developed a list of favorite resources. Because I’m such a nice person, I decided to share them in case they’re useful to any other writers. If you’re looking for a name that has a specific meaning, names-of-baby.com allows you to search both by meaning and popularity. And when you’re looking for surnames, Behind the Name will let you browse by cultural ancestry or you can check out a list of the top 1,000 surnames in the U.S. And if you’re desperately seeking inspiration, they even have a Random Name Generator. When I’m describing a character’s home, I like to know what’s realistic for the region and my character’s price range, and Realtor.com is a great tool for that. As a bonus, the sales listings usually have pictures. Obviously you can avoid describing a character’s home in detail, but since I’m a strongly visual person, I tend to picture every setting I write in detail, so I might as well try to make it as realistic as possible. Another major setting detail is weather. But if you’re writing a contemporary genre and setting your book a couple years in the future, how’s a person to know? Well, by looking at the past, of course. WUnderground can tell you what the weather was like in past years in a certain month or week. And if your genre is historical, you can also view specific days. More weather data than you could ever possibly need, right at your fingertips. This next tool probably won’t be useful to most of you, but since my last couple manuscripts have involved a beach, I’ve become enamored with the NOAA Tides & Currents information. Enter a date a couple years away (future or past), and boom—an exact time for the high tide and low tide. This helps me know whether my character will encounter a wide expanse speckled with shells or a narrow strip of sand becoming narrower by the moment. There you go, some of my favorite resources that help ensure the intricate details of my writing are realistic and accurate. Your turn. Do you have favorite resources that enhance your writing? Beth Pensinger With style and a flair for quirkiness, Beth writes about her life with honesty and a sense of humor. Coffee Cups & Camisoles Humor. Honesty. Life. Some of my favorite people talk about that and more. Jennifer K. Hale A hopeless romantic living in a Thomas the Train world, Jennifer writes romantic Christian fiction. Laurie Tomlinson Not only is she the sweetest person I know, Laurie’s also a fabulous writer with a great eye for details. Murder in Common A blog for those passionate about homicide but don’t actually commit it. Novel Doctor Wisdom and foolishness for fiction writers from an experienced editor. Sisters in Crime The blog of an organization supporting women who write mystery and suspense. The Art in Life A DC blogger shares bits and pieces of life with color and quirkiness. Writer's Digest A comprehensive resource for writers, with articles, classes, contests, and more. Writing Prompts Intriguing prompts, updated regularly, to get those creative ideas flowing.